The difference between three 9's (9.99%) and four 9's (99.99%) availability on your PROFIBUS communications network could mean millions of Rands in lost production that directly affects your bottom line. Network rigidity and availability should be the core focus of any automation engineer who is tasked with maintaining a plant's PROFIBUS communication system. Foundation PROFIBUS Training Course, imparts knowledge on the PROFIBUS specifications, installation guidelines and necessary network components. More advanced PROFIBUS training that goes into detail on the PROFIBUS Specification, FDL analysis and advanced troubleshooting and maintenance procedures. PROFIBUS engineers are equipped to carry out network audits and conduct advanced analysis on the system. Persons responsible for troubleshooting, design and maintenance of PROFIBUS networks would benefit substantially from this course. Builds on top of the standard Certified PROFIBUS Engineers Course, giving advanced protocol specific details on PROFIBUS Process Automation (PA). Being a very hands-on course, attendees will set up a PA segment and learn advanced design, analysis and troubleshooting techniques. Persons responsible for troubleshooting, design and maintenance of PROFIBUS PA networks would benefit from this course. Learn best practices for any industrial automation network, including PROFIBUS, Industrial Ethernet and lower level protocols such as AS-I. Achieving high network availability is discussed in detail as well as a big focus on the necessary parts and components to achieve this. Persons tasked with designing, implementing and maintaining industrial automation systems would benefit substantially from this course. This course is not just limited to the PROFIBUS protocol, as most industrial fieldbus and Ethernet systems work in a similar way. A competent certified PROFIBUS engineer can evaluate each element of your installation, ensuring that all parts comply with the latest PROFIBUS installation requirements. On completion of the system evaluation, an audit report with all recommendations and fixes completed will be issued by the PCC (PROFIBUS / PROFINET Competence Center). Should the installation be found to fully meet the requirements, a report of compliance will be issued from the Competence Center. A comprehensive network audit will give an insight into all the problem areas within your PROFIBUS system. A scheduled network audit is an extremely effective way of preventing breakdowns and downtime from occurring, unnecessarily costing industry inordinate amounts each day. If you have a network audit carried out, this will ensure that your network gets back to the correct level of quality. You can contact your local PCC for a list of Certified Competent PROFIBUS & PROFINET engineers to assist you with a professional network audit. PROFIBUS is often referred to as a 'hardware based protocol', thus it is crucial to have the necessary testing and assessment tools to assist you in fault finding, preventative maintenance and ensuring you have high network availability overall. 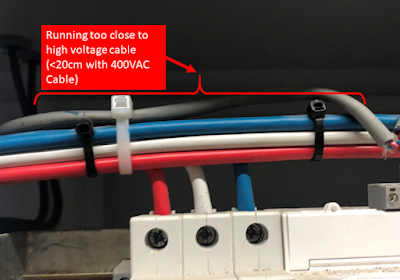 A cable tester will check the integrity and correctly implemented wiring of the cable before commissioning, ensuring that there are no wiring issues such as short circuits, open circuits, missing terminations, breaks in shield continuity, etc. All users responsible for the maintenance and upkeep of an active PROFIBUS network should have access to a reliable and powerful bus analyser. A bus analyser is a hardware and software conglomerate that can read all telegrams being transmitted on the bus and generate key summary statistics of the bus operations. 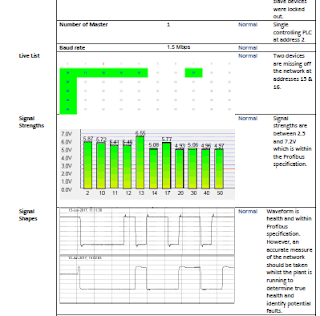 The analyser should also be able to measure and feedback an electrical analysis of the bus signal utilizing an integrated oscilloscope. Implementing an early warning detection system should be able to alert users to potential faults prior to it creating a failure. Permanent monitoring solutions also monitor the network 24/7 and can provide a network engineer with the critical data and statistics needed to effectively correct any intermittent faults and faults occurring outside of maintenance shifts. The entire infrastructure and architecture of your network should be able to feedback error statistics and possible risks to higher level notification systems. An example of this infrastructure may be a SCADA that receives network diagnostic information from lower level infrastructure such as diagnostic repeaters. For critical systems and processes it is necessary to install an advanced permanent monitoring solution such as ComBricks. ComBricks is a modular, permanent monitoring solution for PROFIBUS networks. Each module can repeat to alternate channels to allow for full integration within the network architecture. 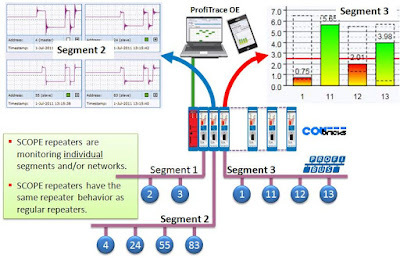 Each module has an integrated oscilloscope and ties into Procentec's ProfiTrace framework to allow for in depth signal, message and statistic analysis. ComBricks transfers the data to the user through an on board web interface which can be accessed through the plants existing Ethernet infrastructure, additionally, it can email users on certain risk thresholds being reached. Last week IDX were called to site at a large commercial residence building in Pretoria, South Africa. Where our client was implementing an IoT solution for remote monitoring and control of various HVAC and power systems in the building. The control system the SI chose in this case was a Modbus enabled Industrial Micro PC called the Revolution PI. The client had Modbus sensors connected to boilers, air conditioning systems, ventilation systems and power meters. Within any fieldbus communication installation, one of the requirements to ensure uninterrupted operation is to implement adequate grounding and shielding techniques. Effective grounding and Shielding help to prevent electrostatic and electromagnetic pickup, which can lead to failed communications. The shield surrounding the communication wires will transfer any picked up noise or interference and drain it to ground. 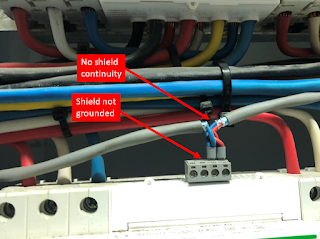 It is important to ground the shield as you enter and exit cabinets and at each device, this provides the shortest path to ground for any interference picked up on the network. High voltage cable and machinery can interfere with bus communications, they do so by electrostatic and electromagnetic injection. One way to avoid this interference / injection on the bus is to separate your communication cable from the source of interference. The adequate separation distances between the communication cable (Category 1) and any high voltage cables / devices (Category 2,3 & 4) is displayed below (Fig.2). Within Figure 4 you can see two scope lines (red and green), this is your B & A lines respectively. RS485 is a balanced system and carries the same signal on both line A & B, however the exact inverses of each signal on each line. Thus any noise that is picked up should cancel out once the signal is combined. This scope was taken on a Modbus installation that was silent and indicates poor implementation of RS485 protection mechanisms. Reflections on a fieldbus cable are caused by an impedance mismatch. One of the major contributing factors causing reflections, is at the end of the fieldbus line where the signal waveform 'bounces back' towards to transmitter and disrupts consecutive signals on the bus (Fig.6). To prevent these reflections, you can absorb the signal waveform at the end of each line within your Modbus network by installing a 120-ohm resistor at the beginning and end of the segment. As segment lengths are increased, the effect of reflections without effective terminating resistors installed becomes more severe.